Nouriel Roubini, famously disposed to seeing the downside in economic news, thinks Americas raging bull market still has room to run. Even Nouriel Roubini, famously disposed to seeing the downside in economic news, thinks America’s raging bull market, now more than five years old, has got some room to run. Perhaps because the New York University professor is known affectionately as Dr. Doom or possibly as a result of the generally sober disposition in his face and voice, even headline writers may be fooled into mischaracterizing his views as negative. But headlines about Roubini pronouncing the demise of the U.S. bull market are overblown. But that really was not the import of what he said in the interview in reply to questions about the U.S. equity market. Rather, Roubini said that price-to-earnings ratios were higher than historical averages, and higher still when looking at cyclically adjusted, or Shiller P/Es, or when looking at specific sectors such as tech or biotech. But he heavily qualified his remarks in a decidedly non-doomsaying way. America’s raging bull market’s still got some life in it, he said. “I would not yet call it a bubble,” the erstwhile Dr. Doom said. Since the S&P 500 is up only slightly above 1% year to date, it would seem that Roubini-following investors need not fear a correction till quite far down the line. Asked by the Bloomberg interviewer if he would expect a correction of 10% or even more, once again Dr. Doom disappointed seekers of bad news with qualifications and even a moment of temporary amnesia that had the effect of softening any sense of negativity. “It depends on how high the stock market goes,” Roubini hedged. “With the recovery of the economy and with the Fed still gradually exiting QE and exiting [its] zero [rate] policy only slowly, the stock market can go higher,” he gloomily conveyed his bullish news. The definition of a market correction is 10% or higher. 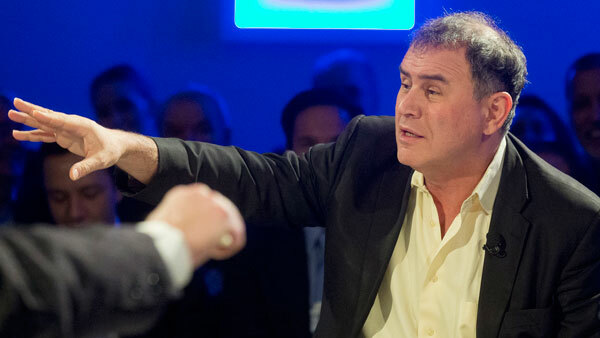 So the real news is that Roubini is fairly upbeat about the U.S. stock market. Indeed, in an address to financial advisors covered by ThinkAdvisor two months ago, the economist forecast a good year for U.S. stocks, expecting gains in the 8% to 10% range. Part of the reason for his upbeat prognosis, for U.S. stocks at least, was what he saw as the very slow withdrawal of quantitative easing. “The risk is not this year, but certainly another couple of years down the line,” he said at the time.